Some people wonder why we need art. But we’re not sure there needs to be a reason. 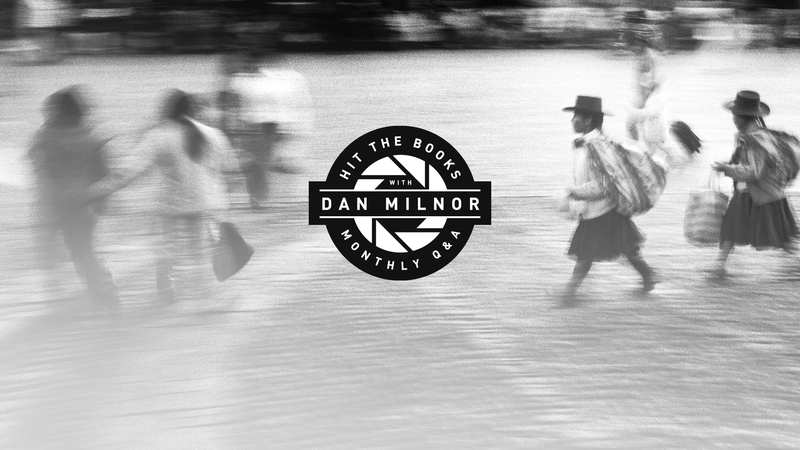 We asked photographer Dan Milnor, why do people create? Can you create for creation’s sake alone? And if so, where does self-publishing fit in? This is such a wonderful but dangerous question. I can feel people beginning to get worked up, but it demands to be asked. I’m going to go with answers I culled from asking young children this same question. Grace, age 7, “Art is poetry, ideas, and niceness.” Jake, age 9, “Art is a chance to be independent.” Caden, age 5, “Art is a dot but then it becomes a flower or even a rainforest. When you start drawing it can take you to a magic land. Art can be anything. Art is everything.” Okay, leave it to children to bring us back to such a wonderful foundation of art and innocence. The essential point here is that art is what you want it to be. A way of seeing the world, a way of thinking, a way of making something as pure expression, or something that has meaning. We live in a world of borders, restrictions, rules, and responsibility. Art is pure freedom. You can create and make anything your mind can dream up, and this acts as a counterbalance to many of the less than savory aspects of being human. Art also works as a translator, connecting people with varying opinions through the filter of light, shape, color, form, or concept. Art allows us to drop our guard and experience. How do I get started with making art? The best way is to just start. Remember, there really is no right or wrong, only how you see the world, or an individual piece you are creating. Create as if you are the only person who will ever see the work. That way you allow for your real vision to shine through and not the vision you think people want to see. Do I need a reason to make art? No. No you don’t. Making art for art’s sake is a GREAT way to breakthrough creative plateaus. When left alone with no strings attached, you will create work that is pure you, and often times, this is the best work you will ever create. A side note to this reality is that creatives are often hired for commercial work based on the work they created on their own. Is art for art’s sake worthy of a book? YES! It is worthy of a book, and perhaps more so than any other book you will make. Again, when you create work for the sake of being creative, it is often the best work you will ever make. Cementing this in a book is a great way to preserve thoughts and ideas. A book is also a testament to what you are capable of. And finally, your book can be a great reminder to yourself of the work that is perhaps most important to you. How do I get started on this book? Just like the work itself. Just start. Don’t overthink it. There is a time and place for considered, sculpted books that are about infinitely critiqued design and editing. But there is also a time and place for the “sketch book”. Some would call this a “test book”. Start small, light, and informal. Something like a Trade Book or Magazine is a great jumping off point. Give yourself limitations when it comes to trim size and page count, e.g. 8.5×11 and 30 pages. Then just GO! Just work with that canvas until you feel good about it. Upload, print, and forget about it until it arrives. Repeat. Are there any materials that are best suited for art? Yes and no. If you are planning to continue working on the book, with your art, after it’s printed, then there are certain papers I like more than others. The Proline Uncoated is my favorite Blurb paper for artwork. It’s thick, uncoated, and holds things like ink and acrylic really well. Is there a chance I could sell my art book? Yes, yes, and yes. Art books are exploding these days, and if you visit any high-end photography bookstore, you will see all kinds of art books mixed in with other, more traditional monograph-style publications. Not to mention there are art book and Zine fairs popping up all over the country, where any and all books are welcome. And there’s always the option of selling your book online in the Blurb Bookstore, through Amazon, or other major online retailers. I want to do a “real” book, but are art books “real” books? I get this a lot, the “real” book thing. Frankly, I don’t know what a “real” book is anymore. I’m guessing people are referring to making a book with a traditional publisher. Working with a traditional publisher, if the deal is right, can be a great thing. However, self-published books are REAL. Very real. They tend to be far more personal, cheaper to produce, and delivered in far less quantity. All things that make collectors happy. There are also several artists using Blurb who have been nominated for “Book of the Year” with small, Blurb art books. Are there any other benefits to self-publishing an art book? I’m glad you asked. Yes. One of the BEST things about creating art for art’s sake, and then turning that into a self-published book, is the freedom and timeline that come along with doing something like this. Working with a traditional publisher is a 12-18-month timeline, minimum, where you are married to the project, and that project, in some cases, can be controlled more by the publisher than by you the artist, especially if the publisher is paying for the project. Often times I see artists get involved in a book deal and several years go by without the artist making any new work as they are consumed by the publishing process. The self-published art book can be a remedy for this. Quick, personal, stylish, risky, different, experimental. Just the way art should be. Given complete freedom, what creative project would you most to like work on? Share your ideas in the comments below or get started today. The highly respected Photographer, Cartier Bresson always thought his photographs needed to be seen in books, not in galleries, surprisingly. He bemoaned the fact he had so very little control of the design of the one book he ‘produced’ ‘The Captured Moment’ . I believe he would have been among the first adopters of what, as artists and photographers we have available today in Printing on Demand and Blurb’s amazing tools. He started out as a painter and in later life returned to painting. I wonder what Henri Cartier Breton would have given us as Photographer, Painter and Book designer!